Virtual and Augmented reality has become a key element to create value for individuals and businesses We continously strive to develop new applications to increase the 3D content and meet the need and demand of our customers. 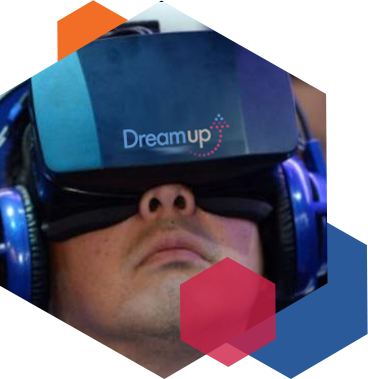 DreamUp with its dynamic and young talents provides one of the largest library for Virtual Entertainment, learning and immersive applications for VRCast, Entertainment, Industries and Education. We are proud to be at the epicentre of this extraordinary experience and we invite you to be a part of it. Our Augmented Reality and Virtual Reality systems along with our applications help you to take extraordinary experience to one step further and to a wider audience. You can use our platforms and stands in your tradeshows, classrooms and shops to benefir from Augmented Reality, Virtual Reality and interactive 3D experiences. The platforms we provide place your customers directly inside the action and gives them the real experience with our Immersive systems. Your trainings, education sessions, marketing and designs can improve drastically with our systems. We provide variety of Virtual Reality and Augmented Reality headsets. 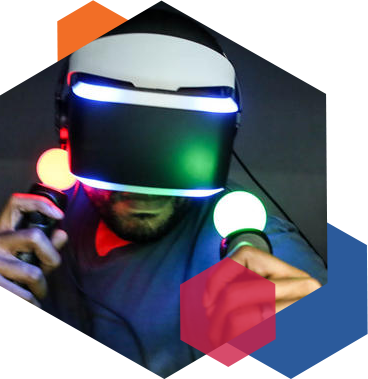 Our applications support most of the commercially available VR and AR devices in the market. © 2019 DreamUP Technologies. All Rights Reserved.